History: (Timeslip: The Coming of the Asgard#1) - In 1963 New York City, Earth had been covered by a new Ice Age due to the Asgardian god Odin deciding to destroy the Earth. As a nearby hospital continued to lose patients, Dr. Don Blake looked to the skies and demanded to know why things were the way they were. The Asgardian Odin watched the plight of Dr. Blake and thought to himself why he put his son Thor in such a burden. Deciding to bring Thor back to Asgard, Odin caused earthquakes across the city as he arrived on Earth in front of Dr. Blake. 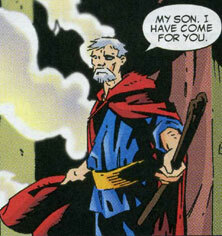 Before Dr. Blake could question him, Odin transported himself and Blake back to Asgard. Transformed back into his true form of Thor, Dr. Blake remembered his true life as the God of Thunder. He then visited around Asgard, eventually seeing his half-brother Loki, who explained to Thor that it was a shame that Odin had cursed Earth. Thor immediately confronted Odin about the curse on Earth. While Odin saw his curse as putting Earth out of its misery, Thor tried to plead the case that many people on Earth were good people. He then asked for Uru, his hammer, and both he and Odin traveled to a cave in Europe to retrieve it. When Thor what would have happened if someone else had managed to get the hammer before he found it, Odin replied that no one on Earth would be worthy. Thor quickly responded that some people on Earth could equal the gods and then suggested a contest for the sake of Earth. Thor soon made his way back to Earth as Dr. Blake to find champions to contest the gods and using Uru, he found a group of homeless people. Thinking them nothing more than homeless, Dr. Blake left them, not realizing that two of them were communicating telepathically. As he left, Dr. Blake bumped into the leg of a Frost Giant named Umak and was picked up, dropping his cane. He was then placed in captivity where he noticed the corpses of Marvel Boy, 3-D Man, Venus, Red Raven, and Whizzer. Discovering that Blake was in trouble, the homeless that he had originally spoken jumped in to save him. As one named Curt Conners made a distraction, another called Jack Hart freed Dr. Blake from his icy prison. Conners soon lost an arm to the Frost Giants as the one called Smithers tried to trap the Giants with roots. Another named Jean soon telekinetically pulled Blake's cane to him after the one called Murdock saved him and Blake transformed into Thor, killing the Frost Giants with lightning. Soon after, as Odin explained to the other Asgardians that he had agreed to allow Thor a contest between humans and Asgardians, Thor entered the room with his newly-named Avengers (consisting of the people that had saved him on Earth). While the Asgardians laughed at the "cripples" before them, Volla the All-Seeing and Loki stood in silence, surveying the situation. Odin then agreed to allow the Avengers to participate in the contest, claiming that the shame would be on Thor if he be tricked. The first contest soon began in Central Park and as the Asgardians prepared for easy victory, the Avengers were concerned about Conners' tardiness. Soon after Conners arrived on the scene, Odin announced for the games to begin with a battle between Murdock the Blind and Balder the Brave, one which Murdock quickly took a dominant lead. The second battle was between Heimdall and Curt Conners. Just as Heimdall seemed to be gaining an easy victory, Curt fell the floor due to an injection of his experimental reptilian formula that caused his lateness earlier. He quickly transformed into a reptilian creature that battled Heimdall. While Heimdall fought the lizard-like Conners, Xavier met Hermod in battle and lost his life in it. 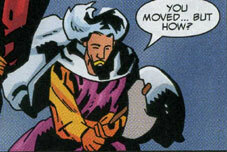 The anguish of Xavier's death caused Jean to lash out telepathically, causing even Odin himself to weep for Xavier. The next battle was between Smithers the Green Knight and Hogun the Grim, one in which Smithers took victory by surrounding Hogun in a forest of trees. The final contest was between Jack Fireheart and Hela, the Goddess of Death. During the battle, Hela attempted to touch Jack's face and cause him dead, only her hand had no accept on the dead skin of Jack's face. As the other Avengers began to triumph over the Asgardians, Heimdall was able to slay Conners but Jack Fireheart slayed Hela soon afterwards. Almost immediately after Hela's death, Loki came to Odin and explained that while the Asgardians had been on Earth, the Frost Giants had arrived on Asgard and began destroying it. Odin ended the battles as "Asgard" fell from the Heavens and crashed into Earth, destroying New York and "Asgard" as well. As Odin mused over his own mistakes, he did not notice a building about to fall on him. Luckily, Murdock noticed it and saved Odin from certain death. With New York destroyed, an impressed Odin announced that New Asgard would be built in its place, a place where Asgardians and humans alike would live in peace. Loki soon came up missing and "Thor" confronted him, admitting that he knew that the real Asgard still stood and that Loki had lied about Frost Giants attacking it. "Thor" explained that he knew the attack was false, having met the Frost Giants earlier on Earth, and then explained that his old friend Hank Pym had become an important part of New Asgard, having used his growth formulas to create a feast out of the smallest fruit. He then revealed to Loki that, in a moment of hysteria, one might not having noticed that the "Asgard" that fell to Earth was only Loki's old model of Asgard, enlarged by Pym's formula. Loki happily gloated that while "Thor" had realized his trick, he had still won because "Thor" dare not tell Odin of the trick in fear that Odin might destroy the peace made with Earth. "Thor" then altered his form to reveal that he was actually Odin in diguise and asked Loki what good was ruling a kingdom with no subjects. Odin then returned to New Asgard on Earth, leaving Loki to weep at his hollow victory. (Avengers Forever#12) - During what became known as the Destiny War that crossed into multiple realities, Murdock the Blind was pulled from New Asgard to aid Rick Jones and innumerable heroic alternate reality Avengers against the Time Keepers and their army of evil alternate reality Avengers counterparts. Comments: Created by Jim Krueger, Matt Smith, and Steve Mitchell. I had never read this story until I bought the book specifically to do this profile, having done a lot of Timeslip profiles for the Appendix recently. I must say that it is a GREAT read! I'd love to see an ongoing Timeslip book where each issue was a different artist's take on a classic character. Not so much like What If?, where a character's life was the same as their Earth-616 counterpart up until a specific event changed but a book focusing on a completely new world where things are vastly different but echoes of its 616 counterpart. Interesting ideas to say the least...I know I'd buy it. This reality was an alternate reality as numerous immortal Asgardians looked vastly different than their Earth-616 counterparts. 3-D Man was a past hero of Earth, having made a name for himself in years past. When Odin released the Frost Giants upon Earth, 3-D Man was captured along with the other heroes of the day, eventually dying by their hands. Not long after, when Thor was captured by the Frost Giants, he found the corpse of 3-D Man amidst other heroes. 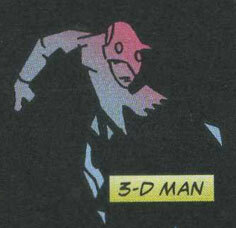 3-D Man presumably had three times the peak human physical abilities that his Earth-616 counterpart had. The Avengers were formed by the Asgardian Thor in an effort to find champions capable of besting other Asgardians in order to prove Earth's worth to Odin. Gathering up a group of homeless, many of which were handicapped in some way, Thor called them the Avengers and transported them to Asgard. While most of the Asgardians laughed at the thought of lame humans besting them, Odin agreed to allow the contest to continue. Once the contest started however, Murdock the Blind managed to down Balder, Smithers the Green Knight made Hogun the Grim seem cowardly, and Jack Fireheart bested Hela. With Odin gone from Asgard to watch the games, Loki enlarged his model of Asgard and caused it to crash into Earth, fooling the Asgardians into thinking that the real Asgard had fallen from the skies. During the scuffle, Murdock saved Odin's life and following the destruction of New York, Odin announced that it would be rebuilt as New Asgard, a place where humans would live in peace with the Asgardians. 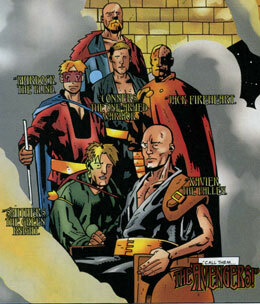 The Avengers were (clockwise from left): Murdock the Blind, Thor, Conners the One-Armed Warrior, Jack Fireheart, Xavier the Fallen, and Smithers the Green Knight. Matthew Murdock the Blind had superhuman senses and a radar sense, like his Earth-616 counterpart, Daredevil. Thor had the same superhuman physical abilities and immortality that his 616 counterpart had. 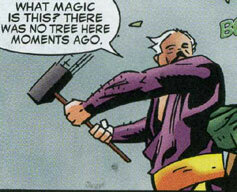 He also used a mystic hammer named Uru to summon storms and fly. Curt Conners the One-Armed Warrior transformed into a lizard-like creature upon downing his experimental formula, just like his 616 counterpart, the Lizard. Jack Fireheart (Jack Hart) could project fire and flames. His Earth-616 counterpart was Jack of Hearts. Charles Xavier the Fallen had telepathy, like his Earth-616 counterpart, Professor X.
Sam Smithers the Green Knight could control and manipulate plant life, like his Earth-616 counterpart, the Plantman. 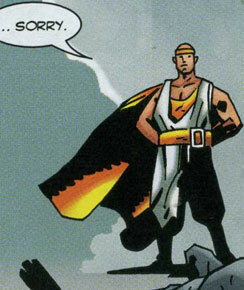 Balder was essentially the same as his Earth-616 counterpart. 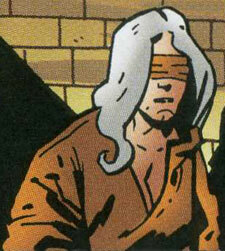 During the contest against the Earth heroes, Balder battled Murdock the Blind. Thinking he would easily best a blind man, Balder was struck down quickly by Murdock's quick reflexes. 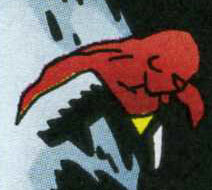 As the battle progressed, Murdock suggested that Balder take a dive but the battle was soon interrupted by the falling of Loki's model of Asgard from the heavens. After New Asgard was built over top the destroyed New York City, Balder lived there with the other Asgardians. Balder had superhuman physical abilities and immortality, just like his 616 counterpart. 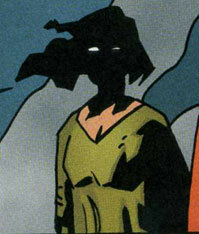 Nurse Foster was the nurse to Dr. Don Blake, the human anchor of the Asgardian Thor. She did her best to help despite the alarming rise in deaths due to the constant snow and ice caused by Odin's release of the Frost Giants on Earth. Once Dr. Blake discovered his true heritage, he thought of Nurse Foster and his other friends while trying to save Earth from Odin's curse. Hela was the Asgardian goddess of death. During the contest against Thor's Avengers, Hela battled Jack Fireheart who seemed to be gaining the upper hand. When Hela attempted to use her decaying touch on Jack Fireheart, Jack replied that her touch wouldn't work on skin that was already dead. As his flames were having no effect on Hela, Jack Fireheart took a sword and killed her. Hela had superhuman physical abilities and a decaying touch, like her Earth-616 counterpart. Hermod was basically the same as his Earth-616 counterpart. During the battle against Earth's heroes, Hermod was to battle Xavier the Fallen. With his quick speed, Hermod was able to easily slay Xavier and apologized as he killed him, not wanting to kill but knowing he had to for the honor of Asgard. Hermod had superhuman physical abilities, immortality, and speed, like his 616 counterpart. Hogun was just like his Earth-616 counterpart and during the battle against Earth's heroes, Hogun battled Smithers the Green Knight. Thinking that he would find easy victory, Hogun was shocked when a tree sprouted up to protect Smithers. Hogun soon found himself surrounded by trees that Smithers had caused to sprout and in his terror, Hogun called out for Odin to help him, making himself seem a coward. Once New Asgard was built over top New York City, Hogun lived there with the other Asgardians. Hogun had superhuman physical abilities and immortality, like his Earth-616 counterpart. Jean was a pupil of Xavier the Fallen and she aided Thor by telekinetically carrying his walking stick to him so that he could transform from Don Blake into Thor. When Xavier joined Thor's Avengers, Jean accompanied them first to Asgard and later to New York City where a contest between the Avengers and the Asgardians began. As Hermod faced off against Xavier, Xavier was easily killed and Jean let loose a telepathic cry that forced even Odin himself to weep at the loss of Xavier. After Loki's model of Asgard destroyed New York City, Jean lived in New Asgard, the city built atop the ruins of New York. Jean had telepathy and telekinesis, like her Earth-616 counterpart, Jean Grey. Dr. Jones was a doctor at a New York hospital who questioned why they were trying to help people in such a dark time. Another doctor reminded Dr. Jones that he shouldn't think in such a way. Loki was similar to his Earth-616 counterpart in that he was known as the trickster of the Asgardian gods. When Don Blake was reminded of his heritage as Thor, Loki made it a point to tell Thor that Odin had cursed Earth by unleashing the Frost Giants on it. Loki then continued to make his model of Asgard as Thor set out to find heroes capable of proving Earth's worth to Odin. While Odin and the other Asgardians were gone to watch the contest between Thor's Avengers and the Asgardians, Loki mystically enlarged his model of Asgard and sent it crashing into New York City, destroying the City. Odin had New Asgard erected over the remains of New York and returned to the real Asgard only to remind Loki that he was aware of his plan the entire time. Odin then reminded Loki what good ruling over a kingdom with no subjects was. Loki had superhuman physical abilities, immortality, and vast knowledge of sorcery, like his 616 counterpart. Marvel Boy was another hero from the past who was killed by Frost Giants when they first arrived on Earth. Thor discovered his body along with the bodies of other heroes of the time when he was captured by Frost Giants. Marvel Boy's powers were not revealed but it is likely that he had the quantum bands capable of manipulating light. Odin was the same as his Earth-616 counterpart, being the head of the Asgardian gods. He sent his son Thor to Earth to learn humility as a lame doctor. Eventually, he decided that Earth was not worthy to survive and sent the Frost Giants to destroy it. Before it could be destroyed, he traveled there to retrieve Thor and remind him of his heritage. Not wanting to see Earth destroyed, Thor challenged Odin to a contest between the Asgardians and anyone worthy he could find on Earth. Odin agreed and sent various Asgardian gods to battle Thor's Avengers. Before an overall outcome could be made, Odin's adopted son Loki sent a model of Asgard crashing into Earth, destroying New York. While Odin was aware of Loki's plot, he allowed the other Asgardians to believe that the real Asgard had fallen to Earth in an effort to teach Loki a lesson. Once New Asgard was built atop the ruins of New York, Odin returned to Asgard to remind Loki that his rule over Asgard was no good without subjects to rule. Odin had superhuman physical abilities, immortality, and the other godly abilities possessed by his 616 counterpart. 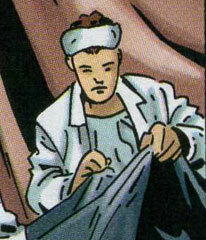 Dr. Hank Pym was a medical doctor working at a hospital in New York City. While he often tried to remind his patients that there was hope ahead, he actually felt like there was no point and that as a man of science, he could offer his patients faith. In such a dark world, he felt like his amazing discoveries in mass relativities meant nothing. 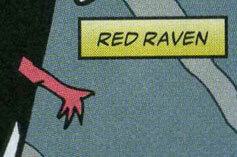 Red Raven was another of the missing heroes who had been captured and killed by the Frost Giants. Thor found his corpse along with the other deceased heroes when he was captured by the Frost Giants. Red Raven could presumably fly via artificial wings. Sif was essentially the same as her Earth-616 counterpart. She was a past lover of Thor but had been apart from him in the years that he spent as Dr. Don Blake. When Thor returned to Asgard, Sif mentioned that she would like to continue what they had once shared but Thor was more concerned with saving the Earth. Sif had superhuman physical abilities and immortality. 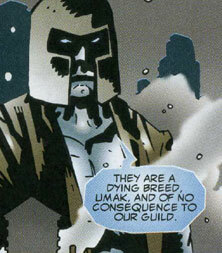 Umak was a Frost Giant that was sent to Earth by Odin to destroy it. He was under the command of Ymir and it was he who discovered Thor in his Don Blake guise. Once Thor was saved by a group of homeless who became the Avengers, Thor used lightning to kill Umak and the other Frost Giants present. Umak had superhuman size and physical abilities. Venus was one of the heroes of the past who had been captured and killed by the Frost Giants. Her corpse was seen with the other heroes when Thor was captured by the Giants. Venus presumably had the love-stimulating abilities that her Earth-616 counterpart. Volla was the Asgardian goddess of the prophecy. When Odin allowed a contest between the Asgardians and Thor's Avengers, Volla repeated that it would all fall down. Her prophecy eventually came true when Loki sent his enlarged model of Asgard crashing down to Earth. Volla had superhuman physical abilities, immortality, and precognition. 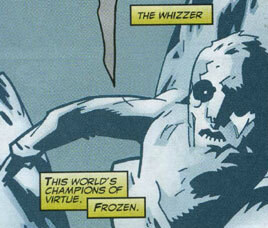 Whizzer was yet another of the heroes who fell to the Frost Giants, as his corpse was frozen alongside the other heroes when Thor was captured by the Giants. Whizzer presumably had superhuman speed, like his Earth-616 counterpart. Warlord Ymir was the leader of the Frost Giants on Earth. When Umak captured Thor as Don Blake, Thor was rescued by those who would become his Avengers. His hammer back in hand, Thor used lightning to kill all of the Frost Giants present, Ymir included. Ymir had superhuman physical abilities and seemed to generate ice wherever he touched.